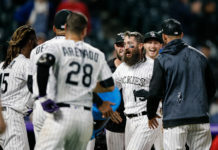 Friday will be a memorable night at Coors Field for the family of Colorado Rockies closer John Axford – whose 2 1/2-year-old son, Jameson, will be given the honor of throwing out the ceremonial first pitch before the Rockies’ matchup with the Los Angeles Dodgers. Jameson is in the long process of recovering from being bitten twice on his right foot by a rattlesnake in late March in Scottsdale, AZ, during the Cactus League. John Axford told Thomas Harding of MLB.com that Jameson spent four weeks in intensive care units because the snake left an uncommonly large amount of venom in the toddler’s foot. Originally, it was feared that his foot or a toe may need to be amputated. 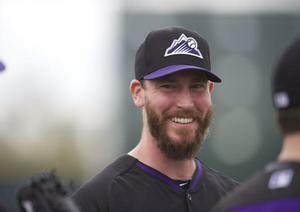 Axford left the Rockies for a week during spring training and for 10 days after the season started to attend to his recovering son. Jameson still can’t walk on his own, so he will be in his wheelchair when he takes the mound and hurls a pitch to his dad in front of the Rockies’ faithful. Jameson’s mom and 3-year-old brother will be in attendance as well. Jameson still has a long way to go in his recovery process. He has his first skin-graft surgery scheduled for Monday. But on Friday night, his biggest decision will be whether to throw out the opening pitch righty or lefty. According to his dad, he switches back and forth.